Pentagon Takes $1 Billion From Military Personnel Account To Build Border Fence The money nearly doubles the $1.3 billion Congress authorized for border wall funding — a move made possible after President Trump declared a national emergency. 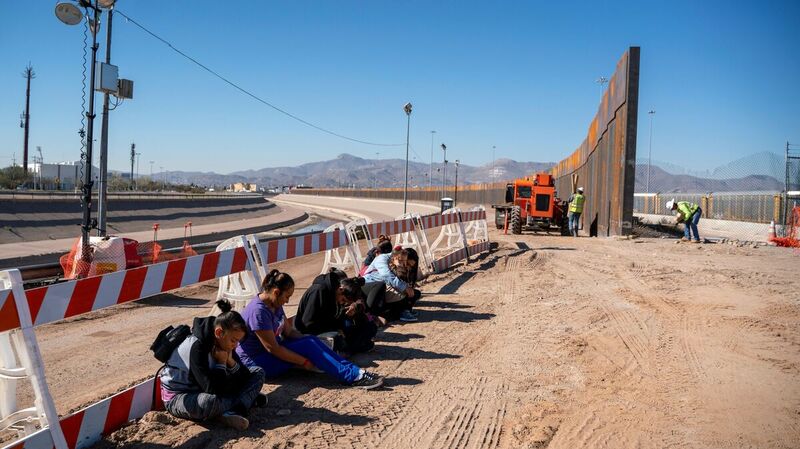 Salvadoran migrants wait for transportation after turning themselves in to U.S. Border Patrol agents in El Paso, Texas — where a border fence is under construction. The Pentagon says it will spend up to $1 billion to help build the fence. The Pentagon won't allow its plan to interfere with military readiness, Acting Defense Secretary Patrick M. Shanahan told members of Congress on Tuesday, seeking to ease concerns about the controversial shift of appropriated funding made possible by President Trump's declaration of a national emergency. "Military construction on the border will not come at the expense of our people, our readiness, or our modernization," Shanahan told the House Armed Services Committee on Tuesday. But in response, committee Chairman Rep. Adam Smith, D-Wash., said the move would likely compel Congress to strip the Pentagon of the authority to "reprogram" funds that have been appropriated for specific purposes and programs. That authority is currently provided only in cases where the Pentagon consults with Congress before acting. But in this case, Smith noted, the Defense Department did not ask permission. "Given a legal order from the commander in chief, we are executing on that order," Shanahan replied. He added that the Pentagon was aware that there were "downsides, which will hamper us" — including likely losing what he called the privilege of reprogramming funds. Rep. Mike Turner, R-Ohio, said that while the committee's members might disagree on border and immigration policies, "We have bipartisan support for the fact that our military budget should not be cannibalized for our border security needs." Shortly after the hearing adjourned, Smith sent a letter to Pentagon Comptroller David Norquist, who had appeared with Shanahan, informing him the committee is blocking the transfer of personnel funds. "The committee denies this request," Smith wrote. "The committee does not approve the proposed use of Department of Defense funds to construct additional physical barriers and roads or install lighting in the vicinity of the United States border." It was unclear how the Pentagon will proceed. "I appreciate the inherent intragovernment complexities of the southwest border situation" Shanahan said in his opening statement. "I also want to emphasize: The funds requested for the border barrier amount to less than 1 percent of the National Defense top line." Shanahan discussed the border plan during a hearing of the House Armed Services Committee, where he testified about the Department of Defense's current budget of more than $717 billion — and where he was questioned about where the money for Trump's border fence would come from. Trump vetoed Congress' attempt to reverse his emergency declaration earlier this month, allowing his administration to move ahead with controversial plans to fulfill his campaign promise to build a wall along the border with Mexico and clamp down on illegal immigration. The House is set to vote on a possible override of that veto Tuesday. The money nearly doubles the $1.3 billion Congress authorized for border wall funding. Trump had requested $5.7 billion. Shanahan is testifying one day after informing Congress that the U.S. Army Corps of Engineers will begin using up to $1 billion to support border security operations by the Department of Homeland Security (DHS) and Customs and Border Patrol. The president cleared the way for that process in February, when Trump took the rare step of declaring a national emergency to get more border security funding than Congress would allow. Objecting to the Pentagon's plan, Democratic senators sent a letter to Shanahan stating that by transferring money without the appropriate congressional committees, the Defense Department had violated the defense appropriations bill. The Pentagon news release then cites 10 U.S.C. § 284(b)(7) — the federal statute that gives it authority to build fences and take other measures to support federal law enforcement agencies that are working to stop drug trafficking. The Trump administration has pursued plans to build more fencing or walls in the face of critics who said he was setting a dangerous precedent by invoking presidential power to override Congress's funding authority — and that the crisis at the border has more to do with social and civil rights issues than with drugs. After Trump vetoed the attempt to overrule his emergency declaration, he tweeted, "This will help stop Crime, Human Trafficking, and Drugs entering our Country." Despite the president's claims, several governors have ordered their National Guard troops to leave the border, saying there is no security crisis. And many mayors of U.S. cities along the Southwest border say their communities are among the safest in the nation, citing FBI crime statistics and other measures. "Send social workers to process the asylum-seekers, not soldiers," Mayor Jim Darling of McAllen, Texas, said, as NPR reported in a fact-check of the president's State of the Union speech about the wall. Eddie Trevino, Cameron County judge in Brownsville, said, "It is a misconception that the border is insecure. There is no Central American invasion. This is a manufactured crisis." Last week, U.S. border officials announced a new policy in Texas, saying agents would no longer detain migrant families who cross the border in the Rio Grande Valley without documentation. Instead, agents will release those migrants and order them to report to courts for deportation or asylum proceedings. Officials said they were acting out of concern for overcrowding and safety. In December, two Guatemalan children who had crossed the border illegally died in U.S. custody, after they were detained in separate incidents in New Mexico.